It has been surprising to find so little fuss in the blogosphere over the newly-passed smoking ban in Iraq. Articles on the subject have tended to express some sense of dismay or curiosity, a sort of “why now?” feeling that puts the Iraqi parliament’s priorities into question. With the most basic of services to worry about – security, electricity, etc. – does it make sense to take up this kind of cause at this particular moment? The measure would ban smoking from all public places, and supposedly may include additional provisions down the road to ban smoking in private vehicles, too. Though certainly a forward-thinking measure and a positive step for public health, it comes with an oddly harsh penalty (the fine is equal to $4,300) that surely few Iraqis can afford to pay. And I can’t imagine many Iraqi smokers are enthusiastic about taking their cigarettes onto street corners in the midst of this month’s recent rash of attacks. Yet of all the countries in the region, how come Iraq is among the first to potentially ban smoking fully in public places? A few have detailed the ingrained culture of smoking in the Arab world – from friends smoking sheesha in coffeehouses to the myriad members of Iraqi parliament lighting up in their offices. Others still have wondered about American troops – with possibly up to two-thirds of American soldiers in Iraq smokers, how could the ban affect them and their morale? Perhaps most interesting is the medical anthropological angle; that is, how the knowledge of health problems associated with smoking is imparted, and how it interacts with cultural practices. It would be interesting to see some examples of smoking education in Iraq, or from other countries in the region (such as Jordan, which has a public ban in place). I find myself very curious about the cultural backlash or resistance to the ban, but then again, there was and is resistance to similar bans in the United States – by smokers and businesses, in particular – but that has not measurably slowed its progress. Graham Hough-Cornwell is an M.A. candidate in Middle East Studies at the Elliott School of International Affairs, The George Washington University. 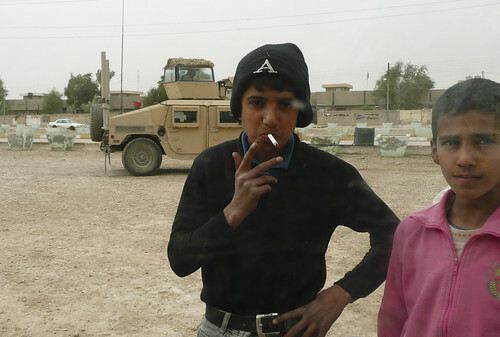 Image: “Smoking Kid,” licensed under Creative Commons on Flickr. Hi Dr. Miller! As a former anthro undergrad from GW, I’ve been following your blog with interest. I don’t know of many tobacco use cessation/prevention communication materials from Jordan, but I did see this one, available through the Johns Hopkins Center for Communication Programs’ Media/Materials Clearinghouse (M/MC). http://www.m-mc.org/print.php The poster is in Arabic, and it seems to be about healthy lifestyles in general, with the message being that not smoking fits into that ideal of a healthy lifestyle for you and your family. The M/MC can often provide more information on the formative research that went into the development of a particular communication material. They are great resource for seeing what other countries are doing in terms of health communication.